We require our feet to move from one place to the other but we often tend to neglect them than most parts of our body. Most people don’t even take care of their feet until they begin to hurt. While there are a lot of things that can lead to foot aches, the majority of these issues can be prevented by the best foot cream. 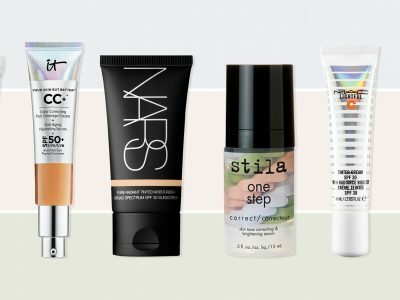 Before you dismiss foot creams as too vain, you should note that regular use of these products can really transform your feet’s skin. For instance, dry skin can really itch, and having an itchy foot isn’t the best feeling for anyone. Once it gets extremely dry it can crack and lead to severe pain. With poor maintenance and hygiene, it can even result in infections as well as more severe health problems. That sounds like a situation you would want to avoid, right? To help you prevent dry feet and their horrible aftermath, let us guide you to choosing the right foot cream for your feet. 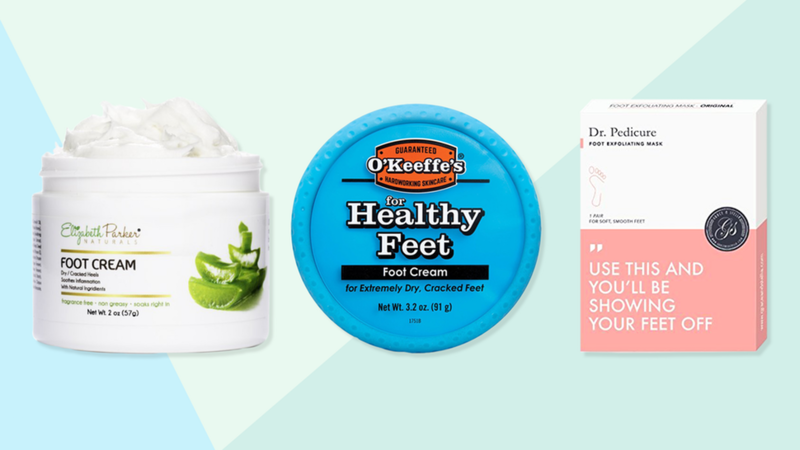 O’Keeffe’s Healthy Feet Foot Cream is a concentrated cream that relieves, repairs, and heals cracked and dry feet. The product forms a protective layer on your skin’s surface that boosts moisture levels by preventing excessive moisture loss. It is a fast-acting cream that starts to transform your feet within a few days. The cream is able to heal all dry and cracked feet to restore the natural look of your feet. 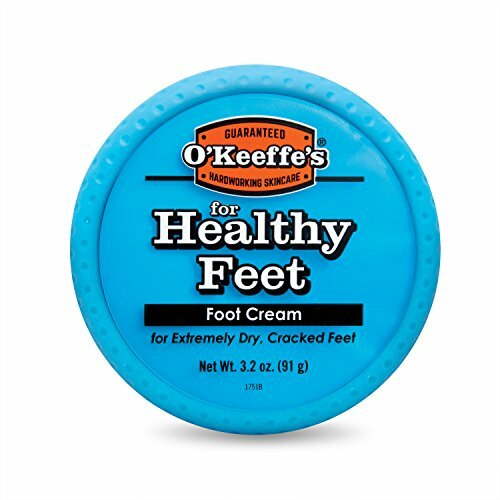 O’Keeffe’s is a healthy product that won’t cause harm to human feet. 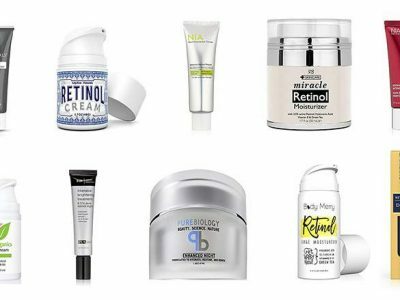 Besides, the cream boasts of increased levels of ALLANTOIN – a great formula that helps to penetrate rougher and thicker surfaces of the skin faster. The manufacturer recommends you apply the cream to damaged skin after bathing or as a night cream, as these are the ideal time to moisturize your dry feet. Also, ensure that your feet are dry before you apply the Healthy Feet Foot Cream. In customer study, 99 percent of user reported better results with Kerasal Intensive Foot Repair than their previous feet products. This has made Intensive Foot Repair to get the title of the best foot cream for cracked heels. The product shows improvement within 24 hours and is specially made to help repair cracked heels and dry feet. It is more than a foot lotion or foot cream; it acts as both a foot moisturizer and foot exfoliator for complete foot care. This product has a unique formula that exfoliates cracked and dry skin and effectively moisturizes to provide smooth, soft feet. Kerasal is different from most creams out there today. It is made of unique patented and highly CONCENTRATED OINTMENT that provides rough and cracked heel healing. This formula of ointment has also been proven clinically to repair dry feet and is a leading prescription for treating feet. The cream is approved by the APMA, thanks to its clinical and scientific data. It is, therefore, recommended by a medical professional and is guaranteed to provide the desired results. Your feet really suffer during the day, so why not treat them during the night with a moisturizing foot cream? 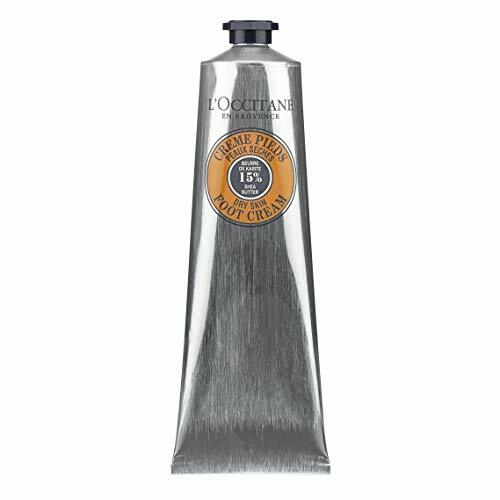 Gold Bond Ultimate Softening Foot Cream is made with a unique formula of shea butter and vitamins that help to soften and smoothen your feet. 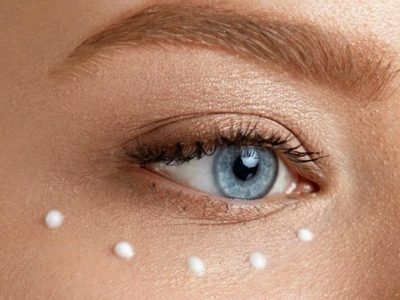 In addition to shea butter and vitamins A, C, and E, the cream features a unique silk peptide matrix that makes it rich and soothing. It is a fast absorbing product with a fresh scent that leaves rough, calloused soles and heels feeling smoother and softer. Actually, it is the best foot cream calluses that you will find in this review. A little bit about Gold Bond. The company has been in business since 1908 – you can rest assured that Ultimate Softening Foot Cream is made by one of the best brands around. And the brand also produces foot powder that can be used along with this cream. With this cream, you don’t need to rush to a pharmacy near you – simply stock the cream in your home cabinet and use it when your family member is hurt, sick, or is in pain. Lotrimin AF Cream for Athlete’s Foot treats cracked toes and feet for effective relief. It is clinically proven to cure athlete’s foot infections and controls fungus that causes athlete’s foot, commonly known as TINEA PEDIS. The product is safe for children of over 2 years, meaning that you can help your little champion with his/her scaly and itchy feet. What’s more, children under the age of 2 years can use the cream under the supervision and advice of a doctor. Lotrimin provides a worry-free antifungal treatment in a greaseless, non-staining, and odorless manner. It is also very easy to apply the cream, taking you just a few minutes to apply both feet. The cream contains 1 percent CLOTRIMAZOLE, a clinically proven ingredient that relieves itchy skin and restores cracked feet. Lotrimin also helps to prevent fungus that leads to athlete’s foot, ringworm, and jock itch. It is easy to apply cream which has been shown to provide a soothing feeling. The product also provides relief from burning, scaling, and discomfort. This is yet another cream that heals the foot from O’Keeffe’s. It is a concentrated cream that repairs relive, and heals extremely cracked and dry feet. 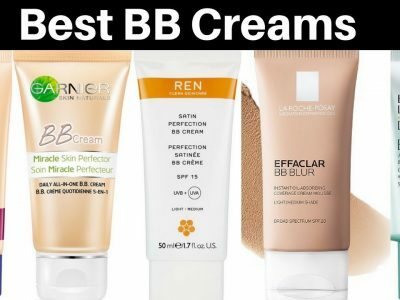 Just like most creams from this reputable brand, the 3 Once Tube cream is able to form a protective layer on your skin’s surface. Furthermore, it is able to enhance moisture level and help to lock it on the skin. The product works pretty quickly and most users start to report a positive effect within a few days of use. It is very easy to apply the cream on your feet – even first time users won’t experience any challenge. Another feature of the cream is the improved levels of Allantoin to ensure that you get a product that penetrates rougher and thicker skin easily. You should apply O’Keeffe’s 3 Ounce Tube Cream after taking a bath or when going to bed to reap the maximum benefits. CeraVe Foot Cream is developed with a dermatologist for dry, cracked and rough skin. It contains salicylic acid, ceramides, and ammonium lactate and does not irritate the foot. These ingredients combine to form a product that softens, smooth and exfoliates the feet after a few days of use. The cream is also able to restore and repair the feet to provide a smooth surface. Another feature of the cream is the ability to prevent water loss from your skin. It also helps to reduce skin redness, resulting in a healed foot that doesn’t pain at all. The product is enhanced by Vitamin D which helps to keep the feet in top-shape and is non-irritating. A fast-paced life, uncomfortable shoes, sport – your feet endues a lot every day and it is only logical to treat it with foot cream. This is where PurSources Urea 40% Foot Cream comes in handy since it treats dry and cracked heels. It has a fast-acting formula that smooth feet in the quickest and easiest way possible than most lotions. This amazing formula deeply softens and moisturizes the feet to produce unbelievable results. The product is 100% made in the USA with high-quality ingredients, so users can have peace of mind knowing that they are getting the best. It is rated highly by most users and continues to transform dry and cracked feet. Urea cream is mainly used to prevent scaly and dry skin and even reduce itching. The cream is recommended for all skin types and cases, thanks to its unique formula. Besides, whether it is calluses or rough skin, this foot cream will get the job done. The cream leaves the feet completely healed and ready for the next day activates. And you can get a full refund from the manufacturer if the cream doesn’t satisfy your needs. Order this product with confidence. This cream works on the root cause of cracked, dry, and rough feet to provide a smooth and soft healthy looking condition. The cream delivers a noticeable result within a few weeks. It is able to exfoliate the dead cell and soften the skin to provide a smooth and soft skin. Chom Nu is also recommended for calluses buildup since its effective formula is able to deal with this problem effectively. The product doesn’t contain any fragrance; only natural ingredients with allspice berry. It is ideal for allergic people and it is tested and certified by a dermatologist. Its main ingredient, PIMENTO DIOICA (allspice berry), is used by indigenous dwellers in the Central America rainforest to relieve red skin, cracked heels, and dry foot. This berry is also used to treat the toes as well as sides of the feet. It contains urea that exfoliates dead cells buildup and calluses while providing a moisture barrier. The cream also has a proteolytic enzyme called Papain that loosens and break down thick, dead, and rough skin. AmLactin Foot Cream provides optimal foot repair with a special combination of a humectant and emollient ingredients. 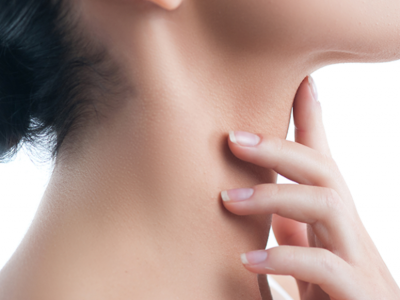 The product improves smoothness and softness more effectively than most prescription skin products out there. The 3-ounce tube makes it easier to carry the cream whenever you go – simply fit it in your briefcase or purse. When it comes to application, simply apply it twice per day or as directed by the physician. Note that AmLactin Foot Cream can cause irritation to broken skins. It is, therefore, recommended to be used externally as a dry skin moisturizer. The cream contains a strong ALPHA-HYDROXY THERAPY that gently exfoliates and effectively hydrates dry and rough skin. This moisturizer also features lactic acid, which occurs within the skin, and is rich in creamy humectants and emollients. The two ingredients combine to smooth and hydrate dry and rough skin. It is very easy to apply the cream on the feet and little spreads over a huge surface. All Natural Antifungal Foot Cream is all you need to keep your feet looking great and healthy. It hydrates and preserves moisture to heal cracked heels and calluses for smooth feet. The product contains anti-inflammatory, antibacterial, and anti-fungal essential oils that offer soothing relief from athlete’s foot and odor. It features 10 simple natural and organic ingredients including lavender, tea tree, eucalyptus, and peppermint. With only the right ingredients, no comprise is made and the cream is soy free, phthalate free, gluten free, GMO-free, and paraben free. Unlike most foot creams on the shelves today, the All Natural concentrated and thick formula offers long-lasting effects. 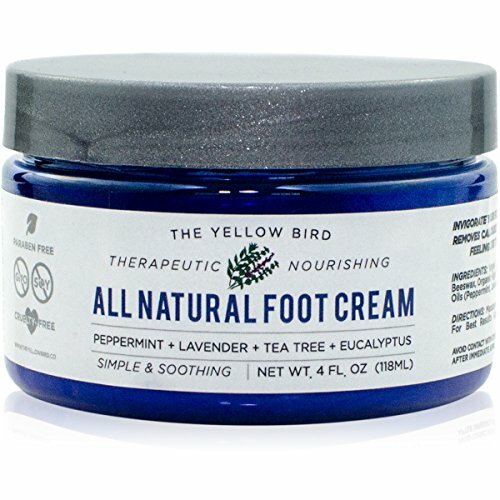 Its unique balm properties offer additional time for the feet to soak up the nourishing ingredients. You can also massage your feet with this cream to enjoy a spa-like experience. Furthermore, the cream promotes enhanced blood circulation, provides a gentle sensation, and moisturizes the feet for optimum soothing. It can also be used to provide relief from neuropathy. 100% satisfaction guarantee, users can use this cream without worrying about any risk. And the brand promises to refund all the users who experience a problem when using the cream. This is a paraben free Urea 40% cream that delivers the outcomes you deserve and expect. It features a unique formula that provides callused, rough, and dry skin healing within days. The cream is scientifically made to prevent itching, deliver treatment for painful cracked hands or feet, soften fungal toenails, and heal dry heels. It boasts of a unique combination of premium ingredients that offers superb rehydration effect. This cream uses powered salt compounds as Urea to provide natural skin care. And for better relief, each container has organic tea tree oil, castor seed oil, organic arnica, coconut oil, organic aloe vera, and organic cold pressed virgin Moroccan argan oil. It is the only urea product with organic material. Paraben free, silicone free, and cruelty-free, this product is tested on people only; no animals used. The product doesn’t contain artificial fragrances or dyes beyond its natural tea and mint tree scent. With this cream, centuries of French cosmetic research meets the American scientific innovation. The cream is made in the USA and is OSAH, cGMP, and FDA compliant and approved. Heavy of ingredients, the product is light on your pocket and offer the right feet healing. No more embarrassment! Miracle of Aloe Foot Repair Cream is a fast-acting relief product for cracked heels and feet. It is able to provide the perfect feet overnight, thanks to its fast-acting ingredients. The cream is also able to relieve unpleasant odors and itching. In fact, it rejuvenates and softens achy and tired feet. This is the cream to apply overnight to ensure that you enjoy relieved feet for the next day. It also features a unique formula that penetrates deep into the skin to offer the desired relief. Diabetic safe, this is the best foot cream for diabetics since it contains ingredients which won’t worsen the condition. The cream is recommended for athlete’s foot and has been on the shelves for over 35 years. It has gained a reputation over the decades for having helped millions of user around the world. The cream is made of ultra aloe processed organic material that is extracted from mature aloe leaves. Therefore, it is a natural product that will not only provide moisture but also lock it in place. 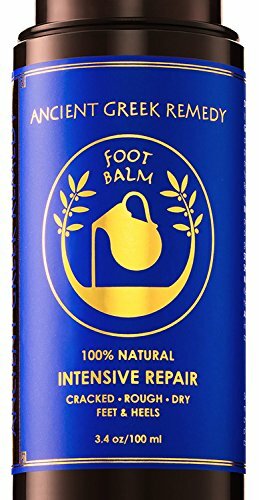 The best foot cream repair and renew dry and damaged skin, help to prevent different foot issues like cracked heels, itchy skin, fungal and bacterial infections, aches and pains, and soften hard skin. 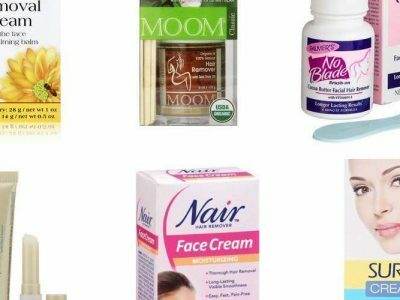 Alternatively, you might need a cream that targets a certain area of your foot or specific foot problem. One of the most common problems is dry feet, which requires a high moisturizing product that absorbs deeply and quickly into the skin. If you are experiencing pain in your feet, go for a foot cream with pain-relieving material like Arnica Montana, menthol, or tea tree oil and essential oils. Besides, foot creams should be hypoallergenic – with no synthetic chemicals and be easy to apply. Also, if you have a certain problem that pains or discomforts your feet – very badly cracked heel or DIABETIC NEUROPATHY – then you need to get a prescription cream from your dermatologist. However, if the problem isn’t severe, you can go for the hundreds of foot cream on the market today.